Barker Shoes are renowned for their quality, craftsmanship and their pleasing aesthetics. For almost 140 years the brand has produced brilliant genuine leather shoes, but they have another strength that is sometimes overlooked; variety. Yes, the brand not only makes quality leather shoes, but they make shoes suitable for all occasions. In this Robinson’s journal, we look at how the extensive Barker range has the right shoe regardless if you’re in the boardroom or out on the town. We are forever hearing how much time we spend in work, some estimates even say it amounts to 21% of your conscious adult life. Obviously, if you are spending that amount of time anywhere, you want to look sharp and be comfortable. Barker have a range of shoes perfect for the office including the Barker Hartley and the Barker Flore. The Hartley is available in a hi-shine finish and is a classic Oxford design - it is plain but has a very unique stitching pattern to make it more eye-catching. The shoe style is new and was released as part of the Autumn/Winter17 Barker range. The Flore was also part of this range and is made using cedar calf leather and is available in 5 shades. Both these shoes offer maximum comfort and formality in abundance. They are available in understated tones making them a smart choice for the office. If you are struggling to reach your working style goals, you may want to read our workwear special. Barker Shoes are often associated with a professional appearance, but they do have a great casual range which is expanding every year. So, to highlight the diversity in the collection, we’ve chosen two completely different shoe types from workwear. Firstly, the Barker Hopper, which is this season’s must have shoe type and an all-time classic: a Chelsea Boot. The Hopper is as fun as the name suggests; it’s an easy-on boot available in four great shades featuring a standout blue or burgundy elastic gusset. Again Barker are not only keeping up with trends, but they are going above and beyond for much deserved style points. Our other casual Barker recommendation is the Barker Farrell, a Goodyear welted slip on with subtle stitch detail on the facing. The Farrell is a sleek slip on shoe, and can be worn with jeans or trousers and is available in tan or black – just as versatile as the rest of your wardrobe. Just as personable as the casual collection and as professional as the workwear styles, Barker’s dress shoes are amazing. If you have a wedding, dressy party or any formal event to attend, do not go without checking Barker’s shoes first. In this instance, you must see the Barker Grant. Very few shoes are available in such an array of colours and designs. 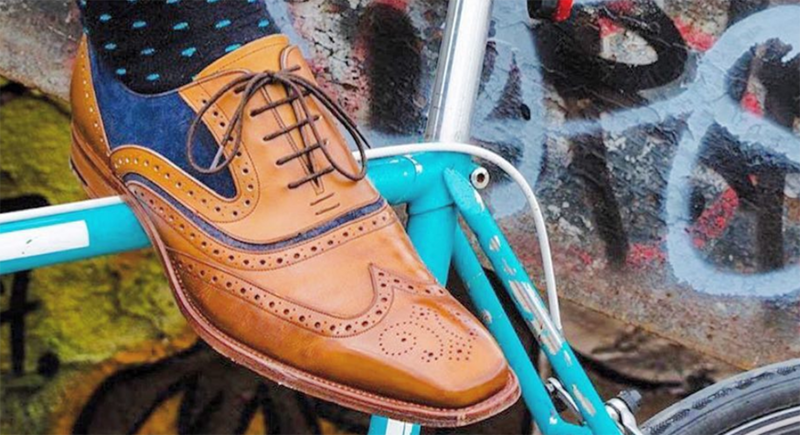 Available in multiple colour combos, this is a modern twist on the traditional brogue. The standout Navy/Blue shades and the lasered Paisley design versions are very stylish indeed. The Grant’s hand perforated patterns are what makes it one of the best in range. The last shoe in this journal is worth the wait and would be a fashionable addition to any outfit. The Barker Valiant, is a truly striking shoe cut from high quality leather. These beautifully made laced brogues are hand painted in 5 colours to give a truly bespoke look, so expect compliments when you wear them. The Valiant shoe is a bold fashion statement and will deliver on those big occasions. At Robinson’s Shoes we stock a various shoe brands including Barker, Cheaney and of course Robinson’s own brand. For more style tips, news on all these brands and early sales info, join our mailing list.